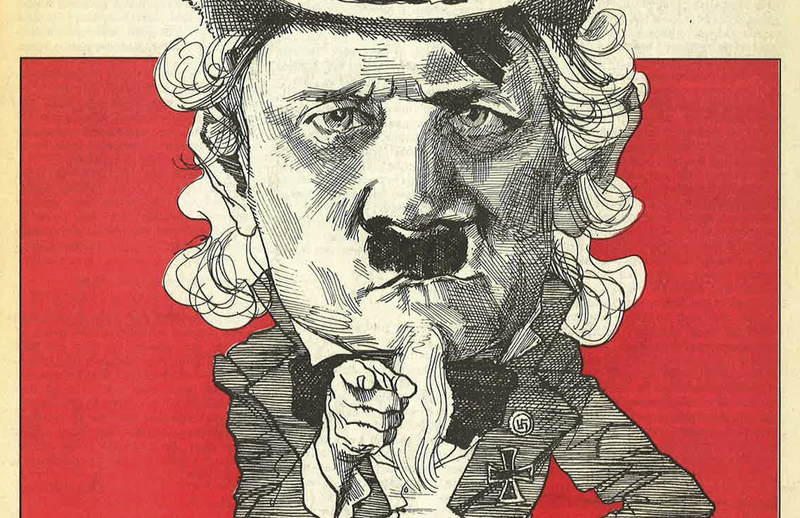 A detail from David Levine's cover for the issue that Langer's essay appeared in. In July of 1990, The Nation devoted an entire issue to a report by the journalist Elinor Langer, “The American Neo-Nazi Movement Today.” Twenty-six years later, it makes for a bracing read. Anyone writing on Nazis or anything connected with Nazis is invariably asked the one question everyone always wonders about, the dread question, the Sinclair Lewis question, “Can it happen here?” and in being confronted with this several times in the course of this work, I came to see that the key word in the question is obviously “it.” If “it” means another Hitler, the answer is probably no, if only because history does not literally repeat. But there are subtler forms of repetition. In a period of declining national authority manifested everywhere from our weakening social structure to our worsening economic position, a movement is stirring that explains it all, and people are starting to listen. The important question for Langer, as she argues in a Nation forum published today, is not whether Donald Trump himself resembles this or that fascist leader of the past but the extent to which the movement supporting him draws strength from, and at the same time strengthens, America’s own openly and proudly fascist movement. As she wrote in 1990, “The neo-Nazis’ ideology and activities are certainly ‘extreme,’ but they exist along a racist continuum on which it is difficult to draw a line.” Over the last quarter-century, Langer says, “The movement has only grown and deepened, coming closer to the mainstream on a lot of issues, especially immigration.” Indeed, Trump is now embraced by both white nationalists and, despite his issuing what the speaker of the House of Representatives calls a “textbook example of a racist comment,” by the current leadership of the GOP. The introduction to Langer’s report is excerpted below, and the entirety of “The American Neo-Nazi Movement Today” can be read below that as a PDF. Langer later expanded her research into a book, A Hundred Little Hitlers: The Death of a Black Man, the Trial of a White Racist, and the Rise of the Neo-Nazi Movement in America, which was published in 2003. The story you are about to read is an ugly one. If it were a film, it would be rated “R.” On television, a solicitous commentator would warn parents to urge children from the room. It is the story of some­thing secret becoming public; of something forbidden becom­ing permitted; of the long, slow re-emergence of racial think­ing in the United States from its retreat after World War II to the point where it can once again energize action; of the gradual, tentative crystallization of a political movement openly aimed at white hegemony. The problems of under­standing this phenomenon are many. Composed of elements ranging from the Ku Klux Klan of Connecticut to the skin­heads of California, the racial movement is scattered and diverse, and on matters as important as its relationship to American society in general and American racism in partic­ular, observers disagree. I want to make it plain from the outset that I am not an authority on the neo-Nazi movement. I live in Portland, Or­egon, where in November 1988 three skinheads murdered an Ethiopian man, and like many of my friends and neighbors, I was startled to see how—literally—close to home it had come. The murder took place in a neighborhood very near where my husband and I had lived when we first moved to Portland years before. Of the three assailants, one was a neigh­bor, living a few blocks away in a building in which I had just considered taking an office; the second was a rock musician and all-round counterculture personage who moved in circles close to those of our baby sitter as well as, at some points, close to mine; and the third was a recent homecoming king of a local high school with some of whose friends and school­mates my own acquaintances also overlapped. Originally, the boys were to have been tried jointly and, my attention having been caught, I arranged to write about the trial for this magazine. It then transpired that the cases were severed, and ultimately, because the defendants all pleaded guilty, there were no trials at all. But in the meantime, as you will see, the trail had led directly from the Portland skinheads, members of a local gang called East Side White Pride, to a California-based neo-Nazi organization called White Aryan Resistance (WAR) and to its youth arm, the Aryan Youth Movement (A.Y.M. ), headed, respectively, by a man named Tom Metzger and his son, John, and my article on the Port­land case had become this special issue of The Nation on the movement as a whole. In introducing to Nation readers a subject that until recent­ly I knew little about, I feel a certain diffidence; my chief comfort in doing so is that one of the things I have realized during this period is how little is generally known. Unlikely as it seems, there appears to be only a handful of scholars at work on specialized aspects of the movement, and as far as I have been able to learn there is no ongoing research of a gen­eral sociological nature. The books that are available have been written mostly by journalists, invariably as a result of having covered some local occurrence, but these, though use­ful, tend to suffer from an excess of anecdote and an absence of documentation. There are organizations that at first glance appear to know everything and without which no one look­ing at the neo-Nazi movement would get very far, but their interests also are specialized, and it soon becomes apparent that though their facts are indispensable their assumptions are arguable, and it is necessary to weigh their interpretations against one’s own. In writing about a subject that carries with it the automat­ic weight of its association with Nazi Germany, I find myself uncomfortable for another reason, suspended between cau­tion and alarm. Especially about a movement as underreport­ed as this one, you do not write, in the first place, merely to observe “This too will pass away”; you write to sound an alert. At the same time, you know that the tests of time are different and that historians of another generation will con­sider the evidence and say either that it was all simply part of another “Brown Scare” in which people, as usual, lost their heads, and some their civil liberties, or that a dangerous move­ment was on the rise and that we failed to discern it early enough and help stamp it out. I do not know where along that spectrum the truth of the neo-Nazi movement lies. I do know that it is among us, that it is violent and mean, and that it is time to open up the subject for further investigation and dis­cussion so that out of a broader base of information and a variety of perspectives there can possibly be fashioned a sound response.